Nov. 3, 2014 — Scientists at the Children’s Medical Center Research Institute at UT Southwestern (CRI) have identified a metabolic pathway that allows cancer cells to survive periods of stress brought on by blocking the major pathway by which cells produce energy. Most cells survive and grow by oxidizing glucose. This pathway involves first converting glucose into a smaller molecule called pyruvate, then importing the pyruvate into the mitochondria where it supplies pathways that provide energy and building blocks for growth. CRI researchers led by Dr. Ralph DeBerardinis sought to understand whether transfer of pyruvate into the mitochondria is required for cancer cell survival and growth. They determined that although blocking pyruvate entry did, as expected, compromise the energy state of the cell, it simultaneously activated a second pathway fueled by the amino acid glutamine. This new pathway provided enough flow of mitochondrial metabolism that cancer cells were able to survive and, to some extent, continue to grow. 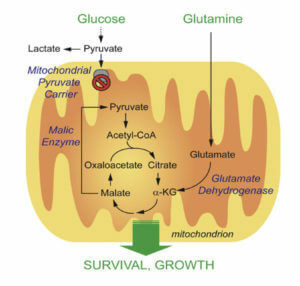 The glutamine-dependent pathway involved activation of an enzyme, glutamate dehydrogenase, which was normally suppressed in cells importing pyruvate into the mitochondria. The CRI research team used models of brain and lung cancer cell growth to demonstrate that blocking either mitochondrial pyruvate import or glutamate dehydrogenase alone was fairly well tolerated. However, blocking both pathways rapidly led to cancer cell death. Similarly, treating mice with inhibitors of both activities simultaneously — but not either one alone — significantly reduced tumor growth. Because many solid tumors, like those in the brain and lung, likely contain regions in which access to glucose or pyruvate is compromised, the new glutamine-dependent pathway may provide a survival mechanism to avoid tumor cell starvation. If so, then blocking glutamate dehydrogenase or other steps in the pathway may provide a therapeutic benefit.